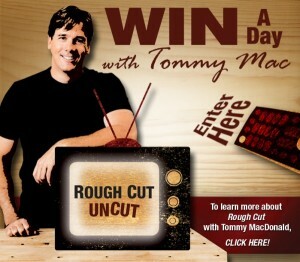 Want to meet Tommy and hang out on the set of Rough Cut? Woodcraft just announced the “Win a Day with Tommy Mac” contest, where the winner gets to travel to Canton, Massachusetts, this July to meet Tommy and watch a day of filming. Details on entering the contest can be found in your local Woodcraft store as well as at woodcraft.com/roughcut. The deadline to enter is April 30, 2011 and the minimum age to enter is 18.